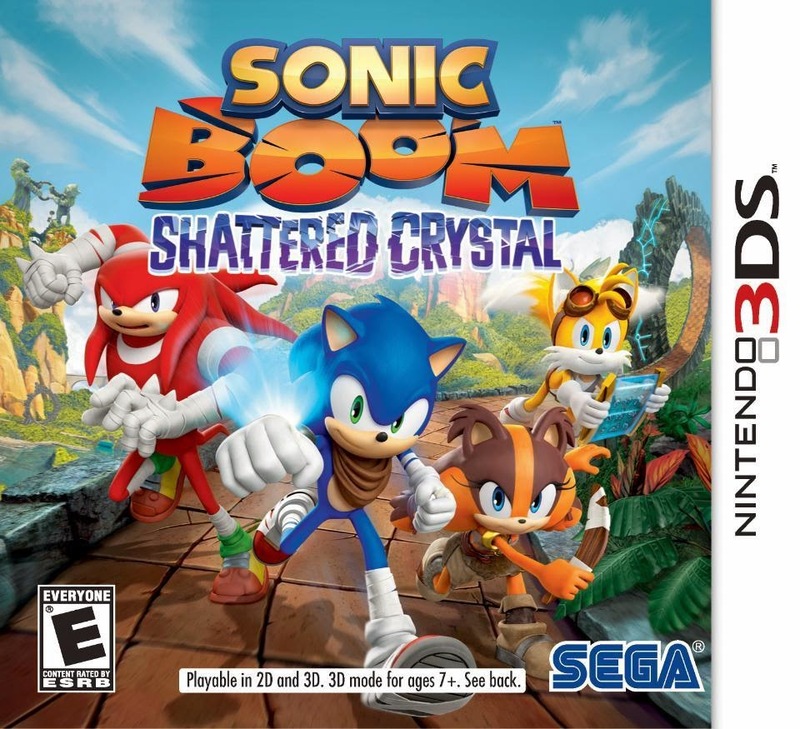 All joking aside, Sonic Boom: Shattered Crystal is good, but still won't be winning any awards. First we have the story, which - just like its WiiU counterpart - is barebones. Amy is fighting Lyric, then when he's knocked down, calls for 'help' on the communicator. Lyric then knocks Amy out. Sonic decides to gather his friends and go rescue Amy - and that's it. The cutscenes in the middle don't even matter. They don't even impact the story whatsoever, apart from saying where you are and how you got there. Shadow and Metal Sonic are in the game, but Metal Sonic plays no part in the story, and Shadow shows up being mind controlled by Lyric [why? ], escaping the mind control after a beatdown, and then shows up during the final battle to help defeat Lyric. There are only three CGI cutscenes in the game. And you only need to watch those to know the whole plot anyway. The rest are text-based with semi-static characters on screen. The stages themselves are fun to a point. Once you memorise which character is on which direction of the D-Pad, you can breeze through the levels, which are filled with a certain thing only a certain character can do. Sonic blasts through blue blocks. Knuckles digs underground. Tails uses gusts of wind to glide [no flyability]. And Sticks uses her boomerang to hit switches. And aside from those, the level design is built with multiple paths in mind. And those multiple paths hide secrets. And those secrets are needed to progress. Within the main levels, there are five crystal pieces and six blueprint pieces to collect. Collect the full set of crystals or blueprints, and you get an emblem. You also get an emblem for finishing the level. Emblems are needed to unlock other stages, and while not bad at first, you need all the emblems you can earn by that point in the game to unlock the final... um... Rival Race. Bosses are not bosses in the normal sense, but are rather races. A one on one to see who can finish first. The last one against Lyric is more boss fight in structure, but still has Rival Race written over it. Simply reach a certain point of the race and a transition to a platform takes place. Avoid attacks, then attack yourself. Repeat another two times. Race element begins again. Repeat the actions twice more. Lyric ramps up his attacks on each fight section, giving more things to avoid. All levels have a nice graphic design, and the music fits well with the stages. Worm Tunnel stages give a better feeling of speed, and are the only 3D parts of the game. Those blueprints you collect give perks, such as locating things on the map [like crystal and blueprint pieces]. The controls are nice, but can sometimes be clunky. And while all levels are good, they don't feel as replayable as any other level from any other Sonic game. Collecting the crystal and blueprint pieces can become a chore and a bore if not actively collecting them during the first [or second] play of a level. That whole system of collecting emblems to progress has a feeling of Unleashed's Sun and Moon medals to it. The game itself is nothing special. It just happens to have some good things about it. In terms of which Sonic Boom game you should pick up, this is the one I would recommend. But that recommendation is a very thin one. Neither of the games can fully be recommended, and if you are after a Sonic experience on a handheld, I would seriously recommend you check out the Rush games on the DS, or even go further back and play through the Advance games on the Game Boy Advance. While Sonic Lost World 3DS is a better game [and the first handheld 3D Sonic game], it is still hard to recommend it over previous games of past generations. And yes, I am aware of what I previously said in Lost World's review. But in all honesty, my opinion on that game was brought down slightly after playing for hours on end only on Windy Hill stages. Not because I can't be bothered to play the others, but because all other stages suffer the game's problems more than in Windy Hill.